Apex Legends is free to play, but it’s monetized with a loot box system that is similar to that of Overwatch. The biggest difference between the two games, for now, is that the the loot boxes in Apex Legends cost more, and they’re not as good. I spent $100 on these loot crates to see what there is to see, and I’ll say this: I don’t think you should spend $100 on Apex Legends’ loot boxes. Here’s how it all breaks down. The loot boxes of Apex Legends are called Apex Packs, and each one contains three items. Loot can be of common, rare, epic, or legendary quality, and at least one item in each pack will be rare or better. Players should find an epic item once in every four packs, according to the statistics listed in the game, and a legendary item once in roughly every 13 packs. But those are the odds, not a guarantee. There is also a pity timer that prevents someone from opening more than 30 boxes without getting a legendary item. skins for Legends: These can be in any of the four rarities. Common skins are just color shifts. Rare skins apply a texture, like a plaid pattern or camouflage, to the character’s clothes. Epic skins apply an animated texture to the character’s clothes, and legendary skins give the character a new outfit that alters their model. skins for weapons: Weapon skins are similar to Legend skins in that the commons are palette swaps, the rares are custom paint jobs, the epic skins apply animated textures, and the legendaries are new models entirely. banner frames: This is the frame around a character on the load screen and on the box that drops when a player dies. These can be common, rare, or legendary. The commons offer patterns, the rares have some kind of image, and the legendaries have more elaborate images that include animated elements. banner poses: These can be rare or epic. The epic poses are animated. stat trackers: These allow you to customize which stats are displayed on the banner card. They can be common or rare, depending on which stats are being tracked. quips: Voice lines that can be common or rare. finishers: These are custom animations for executing a downed foe. They’re all legendary. Crafting Metals: These metals drop in small amounts as loot. Crafting a legendary weapon or skin costs 1,200 Crafting Metals. There is also an extremely rare chance for an Apex Pack to contain an “heirloom”-quality set, which offers a unique voice line and banner pose for Wraith, as well as a special skin for her melee knife. Currently, Wraith is the only class with an heirloom set, and the odds of getting it from a loot box are less than 1 percent. Those odds mean that, unless they’re real lucky, finding the set will cost someone hundreds of dollars. None of these items will affect in-game performance; they are purely cosmetic. The legendary character skins arguably give the coolest visual upgrades, while weapon skins, finishers, and banner frames offer a descending amount of in-game prestige among opponents. You can earn some free boxes for leveling up, but, unlike Overwatch, you don’t get a box for every level up, and you stop getting free boxes when you hit the level cap of 100. You can only get a total of 45 free boxes right now, and if you want more, you have to buy them with Apex Coins, a premium currency that you buy with real money. You also get extra currency for buying in larger increments, which is a common tactic used by games with premium currency to make players spend as much as possible as quickly as possible. Buying five $20 packs of coins rewards 750 fewer coins than buying $100 worth of coins at once, so a player might as well pick up the larger bundles if they’re thinking about getting a lot of loot boxes. They can also buy skins à la carte from a rotating selection that offers one legendary character skin and two legendary gun skins per week. They’ll pay for the privilege, however: Each skin costs 1,800 Apex Coins, which is roughly equivalent to $13. Examining monetization strategies between games is never entirely an apples-to-apples comparison, but the loot system and economy of Overwatchprovide a solid way to compare value to see if new games offer an economy that feels like a square deal. 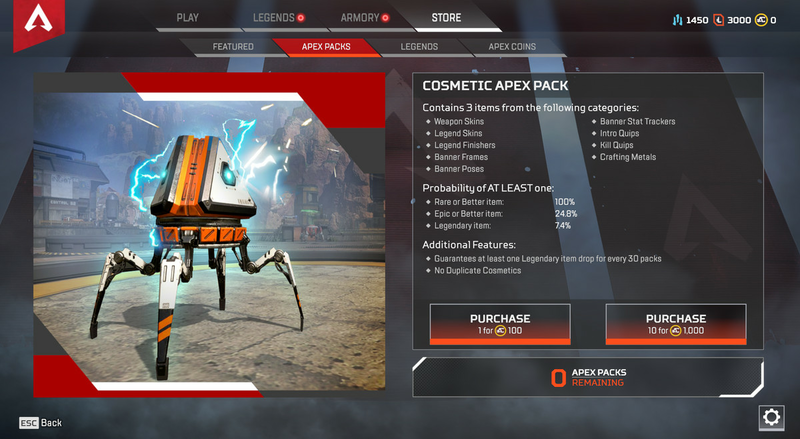 It helps that Apex Legends features a loot system that’s already similar to Overwatch’s in practice, but it’s also important to remember that “value” is a relative term when it comes to cosmetic items. A player might not care about how their character looks at all, in which case, they can safely ignore this economy completely while playing the game. Overwatch loot boxes contain legendary items about as frequently as Apex boxes do, according to odds that Blizzard disclosed to Chinese regulators. Players earn one legendary item for every 13.5 boxes they open in Overwatch. But Overwatch boxes are a little cheaper than Apex Legends boxes: Blizzard sells 50 boxes in Overwatch for $39.99, while spending $40 on Apex Coins only gets the buyer 43 boxes. Maximizing bonus coins by buying in $100 increments — which is a much bigger single purchase than Overwatch asks — grants 115 Apex Packs, compared to the 100 Overwatch loot boxes sold for $80. Each box in a $40 Overwatch bundle costs 80 cents, while those 115 Apex Packs in the $100 bundle cost 86 cents each. Based on the published odds of getting a legendary item, we can work out the math and say that a player winds up paying about $7.40 per legendary item in Overwatch, compared to the $8.50 they pay per legendary item in Apex Legends’ loot boxes. Blizzard runs six Overwatch events a year, during which exclusive cosmetics become available in its loot boxes. Both event and non-event items drop from these event boxes, and Overwatch director Jeff Kaplan has confirmed that event and non-event skins drop from separate loot tables. This means that getting a non-event legendary item from an event box doesn’t affect the pity timer for an event legendary. This is where things get tricky, because, as far as I can tell, there are no confirmed, published numbers for event skin drops. But both my own results, and all results I have seen from surveying YouTube box openings, indicate that players have consistently better odds to earn legendary items than those disclosed. This suggests that event boxes run simultaneous pity timers for event and non-event legendary items, which means that event boxes may be twice as good as regular boxes. This is a good thing for players, as it makes it much easier to gain legendary items during events. On a related note, no one should ever spend money on Overwatch outside of an event. So a regular Overwatch box, based on published odds, has a lower-than-expected cost of a legendary item than an Apex Pack, and Overwatch event boxes most likely come with a lower per-legendary cost than regular boxes. Legendary Overwatch skins also come with a new model for both the character and the character’s weapons, and with the exception of three legendary emote animations, all legendary items in Overwatch are character skins. Apex Legends splits the character and the weapon apart, so a legendary skin doesn’t impact your weapon. And currently, most of the legendary items in Apex Legends are weapon skins. Plenty of other games, like Destiny 2 and Counter-Strike: GO, offer premium weapon skins, and players highly covet some of those skins. But Apex Legends also bloats its legendary loot tables with banner frames, which don’t feel like cosmetics of the same value as those that transform an in-game character or weapon model. Getting a legendary banner frame resets the loot box pity timer for legendary items, which results in fewer Legend skins and weapon skins, because the frames are classified as legendary. I opened 100 Apex Packs to get a real-world example of what of a significant spend would yield in Apex Legends. My results were significantly better than the published odds would indicate, but I was still underwhelmed by my haul. I got a dozen legendary drops: three character skins, three border frames, and six weapon skins. By way of comparison, I found nine legendary skins in the 50 Overwatch Lunar New Year boxes I purchased recently for $40. To be fair, though, that’s also a very good outcome compared to the published odds. I paid about $7.50 for each Apex legendary I unlocked in this case, and $4.40 for each Overwatch legendary. Paul Tassi at Forbes did a similar experiment with Apex Packs and got only seven legendaries, however, at a cost of about $12.80 per legendary. I’ve been buying Overwatch bundles a few times a year for the last couple of years, and the worst haul I’ve ever gotten out of an event bundle of 50 boxes was six total legendaries, at a price of $6.67 per legendary. Much of this still comes down to luck, even if the numbers are meant to nudge things in a particular direction. The Apex Legends legendary skins are arguably less flashy than comparable cosmetics in Fortniteand Overwatch. Legendary skins in those games radically transform characters: McCree the cowboy becomes Sherlock Holmes; Junkrat becomes the Krampus; Reinhardt becomes a football player. Similarly, in Fortnite, legendary skins can turn a character into an ice queen, a monkey king, or even John Wick. The legendary skins in Apex Legends offer redesigns that are much more subtle. A legendary skin in Apex Legends may give a character a different — but often fairly similar — outfit from their base look. The skin may add a different mask or a pair of sunglasses. There’s nothing like a Cuddle Team Leader currently available in Apex Legends, although that may change with time. But for now, Apex Legends is charging more per legendary item for cosmetic changes that aren’t as immediately impressive as those seen in other games. It’s not a great time to spend money on its loot boxes. Loot boxes in Apex Legends cost a bit too much money for their odds of high-tier items, and this initial batch of cosmetics didn’t impress me, but stuff like this almost always gets better with time. To curious Apex players, I suggest: Hold onto your money for a bit to see what comes to the game next — as long as you can tolerate playing without a very low-key legendary skin, a border frame that looks like a temporary tattoo from Spencer’s Gifts, or a custom finisher animation. The stuff in the boxes is purely cosmetic, so you can enjoy the game just as much without the premium skins that it currently offers. Respawn’s roadmap for the first year of the game includes a Fortnite-style battle pass that will be released in March, as well as new characters and weapons later in 2019. There will almost certainly be exclusive cosmetics attached to the season pass, and it seems there will be Overwatch-style holiday events in the pipeline that will further sweeten the deal. Apex Legends is a very enjoyable game at launch, and it’s free to try, so give it a go if you’re in the mood for a new battle royale game. Just make sure to save your money and hold off on buying any loot boxes.